Have you ever imagined, you could use snails for beauty and health? I am not kidding you; this is entirely possible! 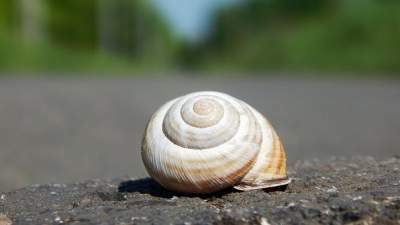 What are snail extract benefits? How to use snail extract as a food supplement? Are there snail skin care products and snail face care products that you can use? Curious to learn what about snail extract for your skin and body? Okay, but let’s first go through some exciting data about snails. Unlike many people think, treating and curing skin with snails is not a modern phenomenon. It was Hippocrates in ancient Greece, who recommended snails to heal inflammation! Did you know that there are more than 40 000 species of snails all over the world? And even more impressive fact comes, that snails exist on our planet for more than 600 million years! How come they’ve survived so long? Maybe, because they contain many essential amino acids, and are very rich in protein (more than 50%! ), while very low in fat? To be honest, I don’t know the exact answer. But what I know is very powerful to us, human beings! Snail extract has fantastic properties, and we can benefit, either eating it (like astronauts) or using it in cosmetic products for our skin care. I’ve mentioned snails possess almost all amino acids, we people, need to live! Molecular research showed that snail slime has a chemical structure, very close to human skin! Thus the regenerating and health effect comes! Let’s dig deeper in snail’s chemistry. Recently, it has been found that the hands of workers, processing snails were very smooth and soft. And even more interesting was their cuts were closing quickly and without scars! These facts provoked research on regeneration snail extract properties. It confirmed what we already know. 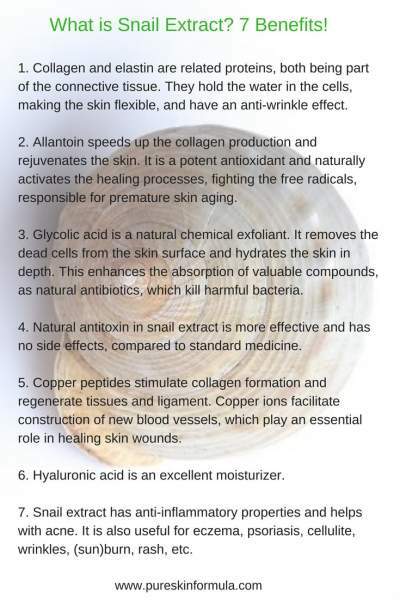 Among the ingredients, we will find collagen, allantoin, elastin, glycolic acid, hyaluronic acid, minerals (copper, potassium, iron, zink), coenzymes, antioxidants, vitamins A, C, E, immunomodulators, natural antibiotics. The concentration of copper peptides in snail extract is impressive! They stimulate collagen formation and regenerate skin. Well, though scientifically more complicated, I will make it simple enough. Snails produce a body secretion. Do you remember seeing a trail the snail leaves, when crawling? Call it a gel, a lubricant, a mucus, or a slime, but this is a liquid, extracted and collected from snails, that has such magical compounds, described above! Typically, snail extract is commercially derived from a garden snail, called Helix Aspersa. How do these compounds work in your favor? 1. Collagen and elastin are related proteins, both being part of the connective tissue. They hold the water in the cells, making the skin flexible, and have an anti-wrinkle effect. 2. Allantoin speeds up the collagen production and rejuvenates the skin. It is a potent antioxidant and naturally activates the healing processes, fighting the free radicals, responsible for premature skin aging. 3. Glycolic acid is a natural chemical exfoliant. It removes the dead cells from the skin surface and hydrates the skin in depth. This enhances the absorption of valuable compounds, as natural antibiotics, which kills harmful bacteria. 4. Natural antitoxins in snail extract are more effective and have no side effects, compared to standard medicines. 5. Copper peptides stimulate collagen formation and regenerate tissues and ligament. Copper ions facilitate construction of new blood vessels, which play an essential role in healing skin wounds. 6. Hyaluronic acid is an excellent moisturizer. 7. Snail extract has anti-inflammatory properties and helps with acne. It is also useful for eczema, psoriasis, cellulite, wrinkles, (sun)burn, rash, etc. If you are predisposed to stomach issues, you could benefit from a syrup based on snail extract. It improves regeneration of stomach ligament. You can use it, to stimulate the immune system, and to fight gastric acid, stomach heaviness, gastric ulcer. Snail extract can positively impact strength and health of bones and joints. In the last few years, the global production of snail extract increases. It has been continuously gaining popularity regarding skin and face care. All these valuable properties led to creating many cosmetic products, including snail extract in their formulas. It is used in products, like hand and face creams, body creams and gels, sun lotions and moisturizers, lip balms. The list is increasing every day. Due to its hydrating and anti-wrinkle properties, a strong trend lately is using snail extract for face products, like age control smoothing snail face cream, or eye cream, which could be entirely combined with caviar. 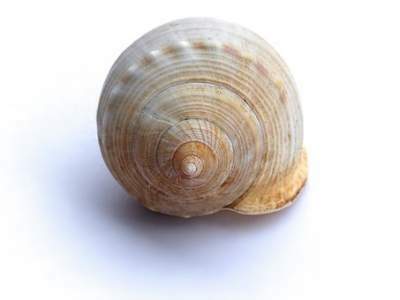 Snail extract could be successfully used in a natural soap recipe. Mixed there with proven ingredients, like shea butter, cocoa butter, avocado oil, beeswax, gold particles and angelica essential oil, imagine how soft, soothed, nourished and aromatized your hands and body will feel! Generally snail extract products are appropriate for all types of skin, for younger and older people, for men and women. From an ethical point of view, it is good to know, that the extract obtaining process does not lead to killing snails. 1. Look for natural cosmetic products, which follow ethical rules, like no animal testing, etc. 2. Explore the origin of products and are there any certificates attached. 3. Check the ingredient’s list. You don’t want a product with snail extract but a bunch of harmful components, which will negate the positive effect, you aim. 4. Look at the overall impression the seller of the product leaves you. Are they profiled in selling natural cosmetics, or they sell everything? Do you know their names and the story behind them? Do they have a website and would you trust it? If you follow these simple rules, you will eliminate many of the low-quality or fake products on the market. To enhance your expertise in recognizing which natural cosmetic products are worth it, and which you have to avoid, read HERE. Well, you already have everything essential you need to know about snail extract, its benefits, and how to use it! If not yet, my opinion is you should add it to your skin, and face care arsenal. Are you ready to TAKE ACTION, finding good products with snail extract and using them? This fantastic creature of nature, called “snail,” could be your “friend.” It’s up to you to make the first step. I would love to hear from you! Do you (plan to) use snail extract for your skin? Leave me a comment, and I will answer you. Very interesting. I didn’t realize that people were using this as a supplement. I do know that some people eat escargot. Thank you for your comment! Yes, many people have included in their diet snails! It is healthy food, rich in proteins and low in calories! But I have focused the post mostly on snails’ uses from cosmetics perspective, as still, people are not much aware of this skin care and face care opportunity! I love what it can do for your skin. I had never heard of snail extract, but I think that it is definitely something to add to my daily skin care. Where do you get snail extract? Thank you for stopping by! I am glad that now you know about snail extract! Take action, add it to your daily skin care! When I find interesting solutions, I will come back to you. For now, you can read some tips how to find good natural cosmetics. Copper peptides in snail extract? I didn’t know that snail slime is so healthy for us, and once I get past the ick-factor I will consider using snail products, as my skin is always so dry. Who knew? Really interesting, and now that I know that it also has anti-wrinkle properties, I’m in…! 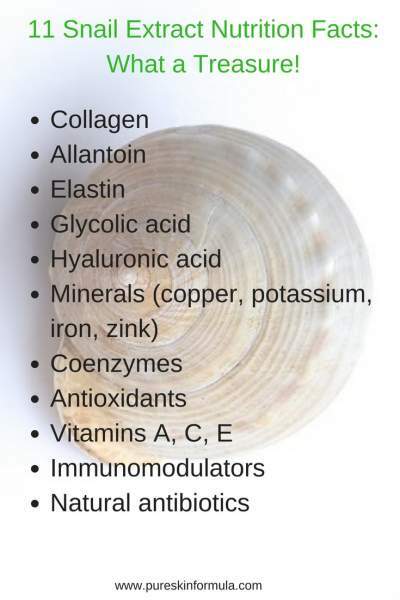 I’ve never heard about snail extract being used in cosmetics or as a food supplement. It doesn’t feel appealing to me even with all these benefits, I suppose it is because of how they look like and the slime they are producing. I’m sure it is nutritious this extract, but it needs some effort to overcome from where it originates. How do I know there is a snail extract in a product? It surely is some scientific term? You have described the snail extract in such a charming way, that I almost could change my mind. Thank you for your comment! Indeed, snail extract doesn’t sound so stylish:) But you don’t have to worry at all. You are right – there is a scientific approach behind it. When you use a product with snail extract, all ingredients are blended in a way, that you get the benefit out of it, without having the negative feeling of touching and using pure snail extract. You cannot tell what part of the recipe is the snail extract, even if you wanted to do so!